WICHITA, Kan. — A conservative Republican who has supported President Donald Trump’s unsubstantiated claim that millions of illegal votes cost Trump the popular vote in 2016 will have to prove Kansas has a problem with voter fraud if he’s to win a legal challenge to voter registration requirements he’s championed. The case headed to trial starting Tuesday has national implications for voting rights as Republicans pursue laws they say are aimed at preventing voter fraud but that critics contend disenfranchise minorities and college students who tend to vote Democratic and who may not have such documentation readily available. Kansas Secretary of State Kris Kobach, who is running for governor and was part of Trump’s now-disbanded commission on voter fraud , has long championed such laws and is defending a Kansas requirement that people present documentary proof of citizenship — such as a birth certificate, naturalization papers or a passport — when they register to vote. “Kansas is the site of the major showdown on this issue, and Kris Kobach has been such a prominent advocate for concerns about noncitizens voting and other fraudulent behavior. He essentially led the Trump commission on vote fraud and integrity and he has been a lightning rod — which makes him a hero to people on his side of the argument in trying to tighten up voting laws, but makes him kind of a mischief-maker and a distraction for people who are on the other side,” said Barry Burden, director of the Elections Research Center at the University of Wisconsin-Madison. The trial before U.S District Judge Julie Robinson in Kansas City, Kansas, centers on the National Voter Registration Act, commonly known as the Motor Voter Law, which allows people to register to vote when applying for a driver’s license. 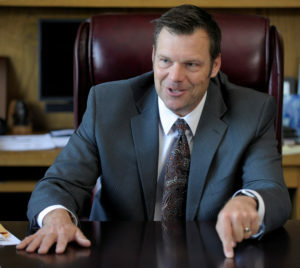 Robinson will decide whether Kobach has legal authority to demand such citizenship paperwork, and a key consideration will be whether Kansas has a significant problem with noncitizens registering to vote. Dale Ho, director for the Voting Rights Project at the American Civil Liberties Union said the case is about what national standards the U.S. will have for voter registration. Kobach’s office didn’t respond to an interview request ahead of the trial, but he has argued in court filings that the law is necessary to prevent voter fraud, contending that even a small number of noncitizens voting could sway a close election. No other state has been as aggressive as Kansas in imposing such proof-of-citizenship requirements. Arizona and Georgia have proof-of-citizenship laws that are not currently being enforced, according to the ACLU. Arizona is the only other state with a similar law in effect, but that law is far more lenient and allows people to satisfy it by writing their driver’s license number on the voter registration form. “All of these states are in limbo while we wait for courts to settle the dispute,” Burden said, adding that other states might be interested in similar laws if Kobach prevails. Kansas has about 1.8 million registered voters. Kobach has told the court he has been able to document a total of 127 noncitizens who at least tried to register to vote. Forty-three of them were successful in registering, he says, and 11 have voted since 2000. Five of those people registered at motor vehicle offices, according to Kobach. In the first three years after the Kansas law went into effect in 2013, about one in seven voter registration applications in Kansas were blocked for lack of proof of citizenship — with nearly half of them for people under the age of 30, according to court documents. Between 2013 and 2016, more than 35,000 Kansans were unable to register to vote. In temporarily blocking the law for people who register at driver’s license offices, Robinson in May 2016 said it likely violates a provision in federal election law that requires only “minimal information”— such as an oath under penalty of perjury that the person is a citizen — to determine a voter’s eligibility. The U.S. Court of Appeals for the District of Columbia also has temporarily blocked the enforcement of the law for people who register to vote using the federal form in a separate legal challenge.